Woke up to a view of sun kissed Shanti Stupa. Such wondrous beauty is a sight for sore eyes. 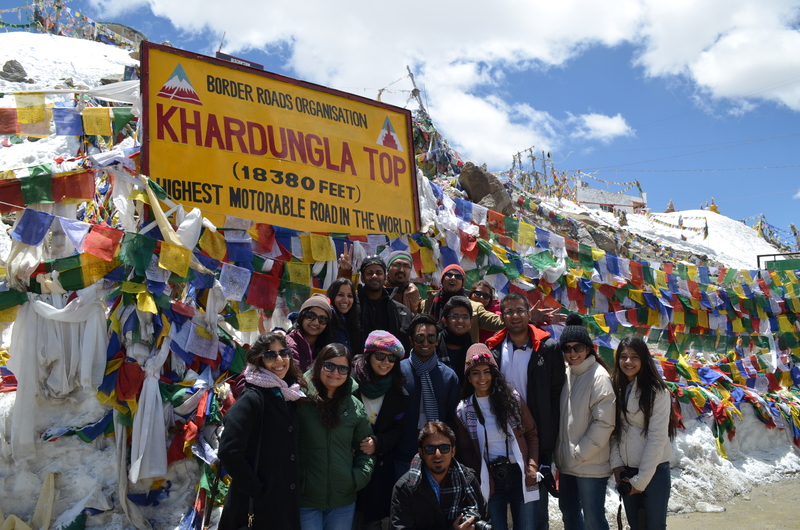 After our breakfast, We left for Nubra at 9 am, while traveling to Nubra valley, you have to pass through Khardung La pass, world’s highest motorable road at 18380 ft. 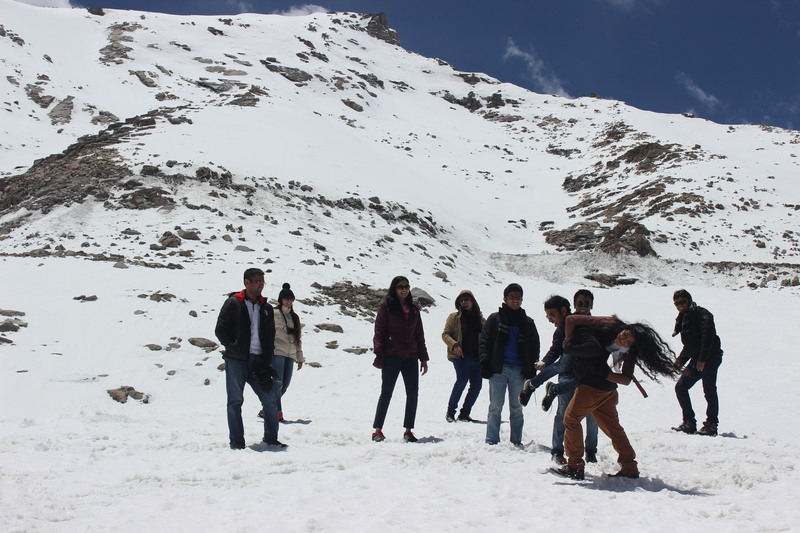 The bus ride from Leh to Khardung La was a lot of fun. We played and that’s dumbcharades when everybody opened up and we all really bonded. 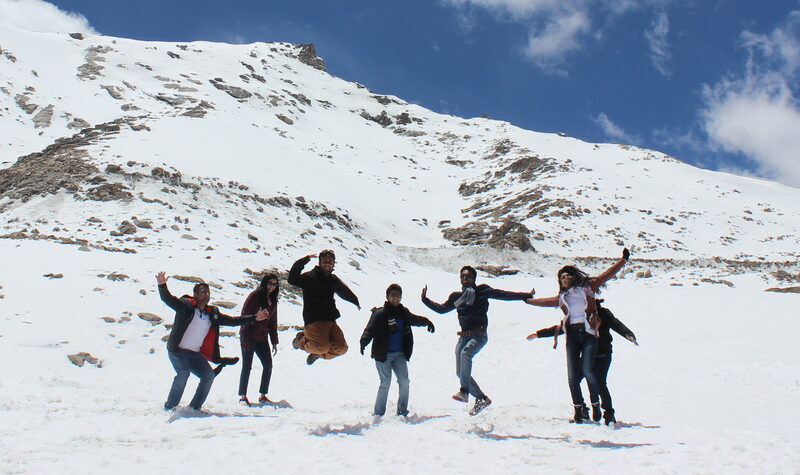 As soon as we reached Khardung La we saw a lot of tourists clicking pictures with the Khardung La board. The sounds of Om Mani Padme Hum could be heard under the breath of wind. You might feel a bit worn out or drowsy but that’s completely fine as that happens because of low oxygen levels. It is advised to not stay there for more than 20-25 minutes because of the thin air. Snow dunking each other, sliding through the snow, the raw beauty of the mountain, the energy of bikers, military vehicles, view of glaciers made that 20 minutes totally worth it. 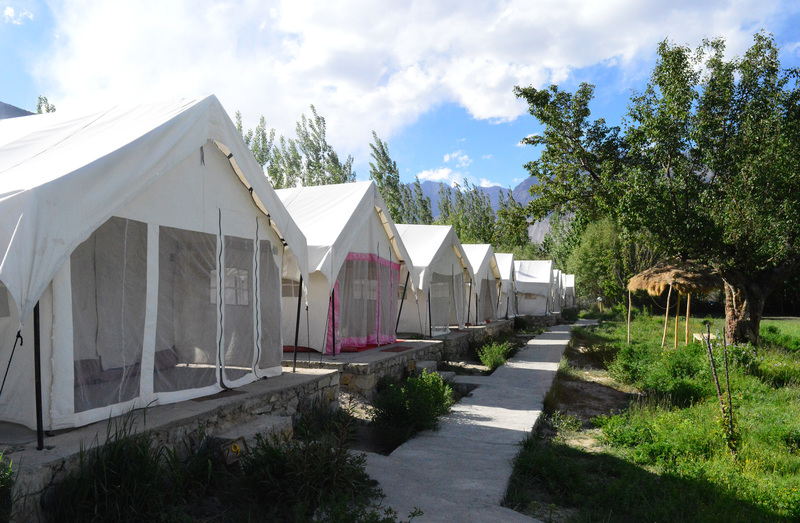 We reached our Deluxe tents in Nubra at around 4. A beautiful camp, put in the middle of nowhere amid the mountains, close to the river. The tents were very pretty and comfortable. Since we had a long journey we all relaxed in our tents for a while. Around 6, everybody gathered outside for sipping their evening tea. After a while we started playing dumbcharades and since this time all 24 of us were together, it was crazy fun. 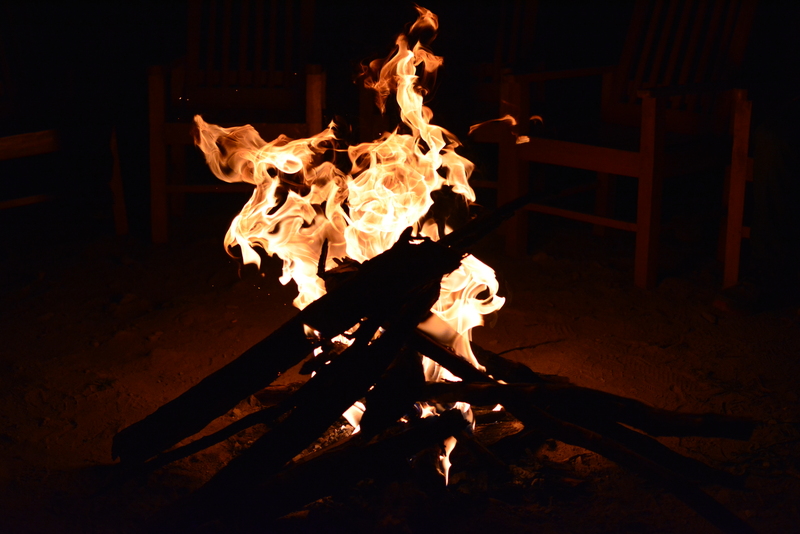 At night, We enjoyed campfire under a clear sky with millions of stars shining bright. This was probably the maximum number of stars that I had ever seen and undoubtedly the most beautiful night sky I ever witnessed. Post dinner session involved playing Mafia, never have I ever, truth and dare. Everybody was going nuts and laughing their lungs out. It was too much fun. The feeling of being around strangers was completely gone. It was like I knew all of them from a really long time. At night we lied beneath the stars, gazing at enormity of the sky. It almost felt unreal. After this a few people went to sleep. While others gathered in a room and we were all dancing and singing (like literally no one is watching us). We called it a night at 3 am. Another day at Nubra awaited. Stay tuned. Awesome scenarios!! perfect trip to go out with your friends thank you Pooja for sharing your experience.Now i know about the place little more briefly .